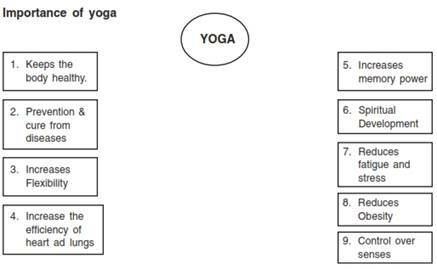 Yoga class 11 Notes Physical Education in PDF are available for free download in myCBSEguide mobile app. The best app for CBSE students now provides Yoga class 11 Notes Physical Education latest chapter wise notes for quick preparation of CBSE board exams and school-based annual examinations. Class 11 Physical Education notes on Chapter 3 Yoga class 11 Notes Physical Education are also available for download in CBSE Guide website. CBSE guide notes are the comprehensive notes which covers the latest syllabus of CBSE and NCERT. It includes all the topics given in NCERT class 11 Physical Education textbook. Users can download CBSE guide quick revision notes from myCBSEguide mobile app and my CBSE guide website. Download CBSE class 11th revision notes for Chapter 3 Yoga class 11 Notes Physical Education in PDF format for free. Download revision notes for Yoga class 11 Notes Physical Education and score high in exams. These are the Yoga class 11 Notes Physical Education prepared by team of expert teachers. The revision notes help you revise the whole chapter in minutes. Revising notes in exam days is on of the best tips recommended by teachers during exam days. Meaning: The term ‘yoga’ is derived from a Sanskrit word ‘Yuj’ which means join or union. In fact, joining the individual self with the divine or universal spirit is called yoga. Yoga as on Indian Heritage: History of yoga is as old as the history of Indian culture. Although, there is no written proof in this regard. Yoga is known as the heritage of India only should go through the related periods of history. Elements of yoga: Around 147 BC, Patanjali developed a system of yoga that contains Eight steps also known as ‘Astanga Yoga. Asanas: Asana is ‘to be seated in a position that is firm and relaxed’ for extended periods. Types of Pranayam: Suryabhedi, Ujjayi, Sheetkari, Sheetle, Bhastrika, Bhramari, Plavini, Moorchha etc. Meditation: Meditation: means concentration of mind, resulting in Samadhi. Yogic Kriya: Yogic Kriya are cleansing techniques that cleanses various internal as well as external organs of the body. There are six yogic kriyas also known as ‘Khsatkarm Kriyas’. Body related benefits of Asana and Pranayam: Improves concentration power, correct body posture, Rehabilitation of injuries, Increases flexibility, Improves breathing system, Improves function of heart, Improves digestive system, Improve overall health, Improves coordination of function between neurology and muscles. Obesity: Obesity is a medical condition when the body of a person contains 20% or more fat as compared to ideal weight. Diabetes: Diabetes is a metabolism disorder in which the person has high blood glucose may be either due to inadequate production of insulin or the body cells do not respond properly to the insulin produced by the pancreas. There are two types of diabetes. 1. Type I diabetes: In this type of diabetes, the body does not produce insulin. 2. Type II diabetes: In this stage of diabetes, the body does not produce enough insulin for proper functioning of the cells in the body and do not react to insulin. Hypertension: High blood pressure or hypertension means high pressure in arteries. It is measured in mm/Hg. Back pain: Back pain is a pain felt in the back that usually originates from the muscles, nerves, bones, joints or other structures in the spine. Main causes of back pain are lack of physical activities, lack of flexibility, smoking, excessive pressure on back etc. Yoga class 11 Notes Physical Education. CBSE quick revision note for class-11 Mathematics, Physics, Chemistry, Biology, and other subject are very helpful to revise the whole syllabus during exam days. The revision notes covers all important formulas and concepts given in the chapter. Even if you wish to have an overview of a chapter, quick revision notes are here to do if for you. These notes will certainly save your time during stressful exam days. To download Yoga class 11 Notes Physical Education, sample paper for class 11 Chemistry, Physics, Biology, History, Political Science, Economics, Geography, Computer Science, Home Science, Accountancy, Business Studies and Home Science; do check myCBSEguide app or website. myCBSEguide provides sample papers with solution, test papers for chapter-wise practice, NCERT solutions, NCERT Exemplar solutions, quick revision notes for ready reference, CBSE guess papers and CBSE important question papers. Sample Paper all are made available through the best app for CBSE students and myCBSEguide website.